Michelle Nicolle and band were appearing at the Lido Jazz Room. It’s a little room located in the Lido Cinema complex with no windows and cinema staff providing drinks to your table for 50-or-so listeners after paying entrance at a box office. Strange, but comfy and intimate. Intimate enough for chats with other listeners and perfectly intimate for Michelle who sings so close, with such detail. We could hear every nuance here and it’s all a gem. And she’s daring. The first set was comfortable and hugely developed standards but then there were first takes and sight reads in the second, and not too predictable, but a cover of Mark Murphy with dropped beats and a take on Isfahan that melded into Caravan with an F that was refused in London. Thus her call to Frank that “I never like to tell people what to play, but can you play that” in their ongoing repartee of the evening. This night Frank DiSario was playing and he was big and boldly toned and delightfully expressive, not least in solos, including some wondrous swaps with a cheekily accelerating Geoff Hughes. No bass could keep up with his guitar speed and Frank answered by slowing and it worked. Ronny was in his corner with his occasional fours, too, but mostly unobtrusive, quietly delightful and subtle accompaniment. They could all twist the feels, too, sometimes to swing also elsewhere, extended twos against swing or latin or whatever. In this space and with this PA we heard it all, Geoff’s woody, uneffected tone and generous clarity from both Frank and Ronny and Michelle’s gloriously even deliriously detailed treatment of lyrics and inventive, intelligent scats. How satisfying was this. We heard it all to the n-th degree of subtlety in this space and I for one just melted with the beauty and skills of it all. A treat of the highest order: an intimate space and a master or a few who knew how to use it. Absolutely fabulous. 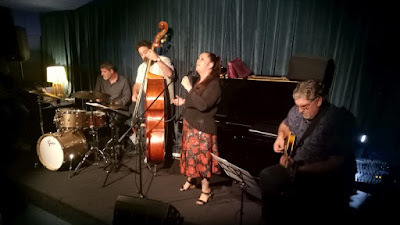 Michelle Nicolle (vocals) led a quartet with Geoff Hughes (guitar), Frank DiSario (bass) and Ronny Ferella (drums) at the Lido Jazz Room in Glenferrie Road, Hawthorn.